Athens NightLife - The "Bouzoukia"
If there is one thing Greeks pride themselves on, it's their ability to have a good time. Entertainment in Greece is combined mainly with going out at night, and particularly for the Athenians nightlife is sacred. 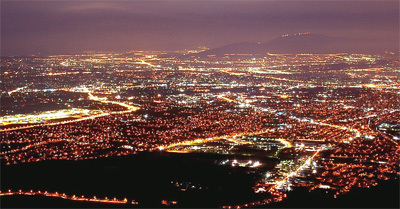 They are fond of comparing their city's night scene with New York, Paris or Amsterdam and they believe that it surpasses them. This is what every resident of the city thinks and it is, actually, a fact! Nightlife in Athens gets going after midnight and keeps going until dawn. It is quite interesting fact to mention that some years back, a governmental law tried to impose stricter closing times to nightclubs (closing at 3 am) to boost the country's productivity, but the a virtual rebellion put a stop to that and Athenians could keep on partying happily all hours. Bouzoukia- this is where the majority of the Athenians enjoy most going, at bouzoukia Athenians spend more money than anywhere else, at bouzoukia you will find customers from different social backgrounds mingling and celebrating together, to sum up, at bouzoukia one can intensively feel a fatalistic Balkan sensibility: that destruction and death may well come tomorrow so it's best to live it up to the dizzying heights of tonight. Thinking of Greek Music the first thing that may come to your mind will be the bouzouki (Greek μπουζούκι). This music instrument has been combined with history of Balkans, and particularly Greece, for many years and is part of its traditional music. The music and the clubs that play it, are referred to as bouzoukia (deriving from the plural of the word bouzouki – Greek μπουζούκια), after the primary instrument involved. For sure, one would wonder how come the Greeks ended up calling the clubs that play a particular type of music with an instrument's name. Accidental fact? Not at all! Let's have a look at the history of Greek music and discover together the reasons that made Bouzoukia the main entertainment for Athenians. Investigating the history of Bouzoukia, one could go back to the Ottoman Empire…BUT we do not mean to discourage you from reading. On the contrary we wish we could inspire some of the readers to research on Greek music and maybe go to bouzoukia, in case they find themselves in Athens. So let's start with Rebetiko! 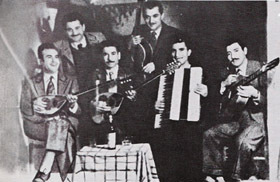 Rebetiko is arguably the original music of Athens. The roots of the music can be traced to the 1920's Piraeus hashish dens, populated mainly by immigrants who arrived in Greece from Asia Minor. The main instruments have been bouzouki and the smaller baglamas; the rhythm was tapped with hands, feet spoons on glasses or anything else on hand. The lyrics of rebetiko music often focused on drugs, humiliating police and prostitutes. After 1938 censorship forced the rebetes (rebetiko music songwriters & players) to change the themes of their songs. Some of the truest rebetes that have influenced with their songs Greek music are Vamvakaris, Batis, Artemis, Stratos, Tsitsanis. 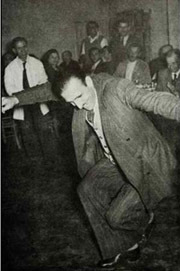 Rebetiko soon became popular and some of the poor rebetes became stars. This, initially marginalized music genre, gave birth in the 1950's to “laiko tragoudi” (meaning popular/folk song ). To make things clearer this is more or less the same case with Western pop music, that can trace its origins to jazz, blues and soul. In the 50's and 60's laiko puts rembetiko aside and a new era in Greek music starts. Rebetes tend to accuse this new music genre as foreign and imported. Tsitsanis, a famous rebetiko performer, used to call laiko music as “indoarabic”. This is partly true. The influence of oriental rhythms on this new Greek music has been strong. Nonetheless laiko conquered Greek music and Greeks, thanks to its vivid and happy rhythm. Many consider Manolis Chiotis the father of the laiki Greek music. He has been a song writer and an incredible virtuoso of bouzouki. 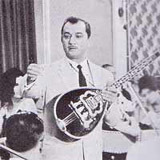 In 1953 in order to make bouzouki play quicker, he has put an extra pair of strings to it and created the modern, tetrachordo (with 4 strings ) bouzouki. This is how & why bouzoukia are born. From the need of Athenians to let themselves go, nibble, drink and dance while listening to their favorite music live from their favorite artists. Q: How many bouzoukia are there in Athens? A: In Athens there are 50-60 bouzoukia – to this we do not include taverns & bars with live music. They are open from 5 to 7 days a week, depending on the popularity of the club. It is extraordinary that almost every day, or should I better say night, they are full. If you wish to go to bouzoukia during weekends, you should have reserved your table couple of days in advance. Reservations for Christmas, New Year's Eve and other special days are usually done a month in advance, as demand is high. Q: At what time should I go to bouzoukia? A: The show starts at midnight and ends when the sun rises. Very few after-bouzoukia may cloze at 8 or even 9 o clock in the morning, but this is an exception. At the beginning the show at bouzoukia is more like an introduction. After couple of hours and …couple of drinks, the atmosphere becomes more and more festive. And around 4 in the morning is when guests of bouzoukia reach the so called in Greek tsakir kefi, meaning the peak of the night's entertainment. Q: Are bouzoukia open all year long? A: No. But they are open almost all year. Particularly singers that perform at bouzoukia need to take breaks, so they work usually from November to March (winter season) and from April to July (summer season). Each one of the bouzoukia-clubs has of course its own schedule and as a result you Athenians are able to go to one such nightclub at any time of the year. Q: Who sings at bouzoukia? A: At bouzoukia today's stars take stage. The Greek singers that you listen on the radio, every night perform at bouzoukia. Their live performances are also their main source of income, as albums sales in Greece are low, due to the limited market & pirate cds. Each bouzoukia-nightclub owner arranges collaboration with artists for the winter or summer season. 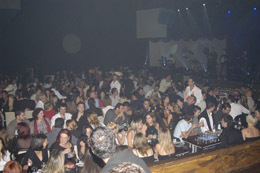 The show at bouzoukia lasts from 5 – 8 hours, therefore each bouzoukia-nightclub has more than one singers for its show. 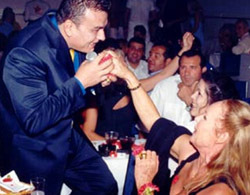 The famous Greek stars singers will be found at the big bouzoukia-nightclubs. 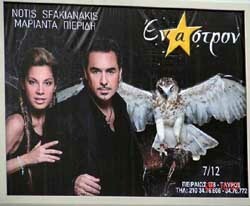 To attract more Athenians bouzoukia owners try to book two or even three famous singers. As a result at bouzoukia guests entertain themselves by listening to their favourite stars. Q: So, bouzoukia shows consist of 2 or 3 singers? A: No. The famous singers are always accompanied by younger artists. These artists usually do not have their own albums. Therefore they are the ones who start the show at around 12 by singing Greek smash hits. The “main singers” take stage at around 2 and usually sing their own hits. So, to answer to question a bouzoukia-nightclub may have from 6 to 15 (!!) different performers and dancers to entertain its guests. Giant advertising poster with the group of singers at Skyladiko VIP bouzoukia. Q: How is the arrangement of bouzoukia-nightclubs? Are they concert halls? A: Bouzoukia are not concert halls, nor do they resemble to clubs. There is an elevated stage on which there is the musicians – with the bouzoukia instruments of course-, dancers and singers perform. Moreover there is a court of elongated tables positioned at right angles to the stage so that every guest can see the spectacle. The corridors between the tables are rather narrow, so as to increase the capacity and have more tables for the guests (Greek techniques!). The customers and the waiters of bouzoukia have difficulties in moving around, due to the lack of space. The tables that are attached to the stage are considered to be the best ones and are therefore the most expensive ones. For more information on proto trapezi pista, as these tables are referred to in Greek, read below at Bouzoukia Savoir Vivre. Bouzoukia-nightclubs owners have also thought of those who do not want to spend a fortune (reserving a good table). They have therefore created bars for customers, who'll just pay an entrance free (ranging from15-20 Euro & including a drink). These bars are in the less privileged areas of the venue, away from the stage, and the customers have remain standing. Q: I intend to reserve a table at bouzoukia. Can I eat there too? A: At all “descent” bouzoukia there is a short menu, but it is rarely ordered. The prices are high and the quality is doubtful. It is strongly recommended that you have eaten beforehand. At bouzoukia alcohol beverages are mainly consumed. They are accompanied with assorted nuts and row vegetables. Bottles of water are also include in the rate. Despite the popular perception, there is not much plate smashing to be had in Greece these days. Throwing plates at the performer's feet was a popular practice until the 70's. This custom, that has provoked many injuries, was forbidden by law. But Greeks soon found another, more “peaceful” manner to express their joy at bouzoukia; throwing carnations that are sold inside the bouzoukia-nightclubs. 30 years ago any guest could ask the musicians at bouzoukia to play one of their favourite songs. Most of the times this special order would be accompanied with some money, for the special treatment. A traditional gesture was to approach the main bouzouki player, take in hand one banknote, spit on it and stick it on his forehead. Another popular belief related with bouzoukia are the fights. Though it used to happen in the past, men in Greece do not fight anymore within bouzoukia premises. In 1973, dictatorship era in Greece, Nikos Koemtzis ordered at bouzoukia a zeibekiko. This is a dance designed to be performed by one person only. Some people interfere during his performance by dancing simultaneously. This insult lead Koemtzis to stabbing eight persons, three of which died. He will be sentenced for life and granted grace in 1996. Immediately Koemtzis order at bouzoukia became a front page story and few years later, in 1980, a movie (“Parangelia” meaning order). In modern Athens, bouzoukia fall into different a couple of different categories. Opening an Athens nightlife magazine, you will find the bouzoukia-nightclubs into different categories, according to the style of the venue and its performers. The variety of choice is inexhaustible and results to an artistic package that is hard to beat. Though all favor fancy stage shoes, vast consumption of alcohol, liberal spending and thoroughly decked-out performers and clientele, some play a high quality of more traditional Greek music, with old school singers and laiko & entexno music. 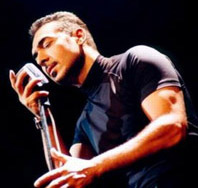 Yiannis Kotsiras, Mihalis Hatzigiannis, Alkistis Protopsalti and Dimitris Mitropanos are some of the famous Greek singers that offer quality shows and music. Another branch of bouzoukia – maybe the most popular one - is heavily mixed with Western commercial pop. These performances tend to favor laser-light spectacles and catchy tunes. The kings and queens of this scene are just as likely to perform in tight leather pants and bustier as in sparkling evening gowns. Ruling singers are Sakis Rouvas and Georgos Mazonakis and the divas Anna Vissi, Despina Vandi and Helena Paparizou. The lowest form of bouzoukia is called skiladiko, literally, “dog houses”. These are the places where the level of tackiness and ostentation is high, and the quality of music low. (fascinating places for a cultural anthropologist) Usually skyladika attract lower class of customers. The selection of the women performers at skyladika is usually based on their good-look and not their voice. It is believed among Greeks that the worst voice a singer has, the less clothes she tends to wear. Bouzoukia, as institution in Athens nightlife, are connected with a whole culture. It's high time to explore the “savoir-vivre” of bouzoukia. Starting from the look of the clientele of bouzoukia, we should notice that everyone is dressed up. Athenians generally like to dress up to go out at night, and the more stylish the place the better they try to look. At bouzoukia you will see men in suits and women in with glamorous make up, fine coiffures and their best outfit. At all bouzoukia nightclubs there is a photographer, who will, for sure, take your picture, either you want so or not. These “paparazzi” do not work in the bouzoukia in order to create a photo album with the clientele of the club…. in minimum time possible the bouzoukia photographers would have developed the pictures, they'll come to your table and offer them to you in the special wrapping. You can always decline their offer, but usually bouzoukia customers buy their pictures as souvenir. As mentioned above the throwing and smashing plates practice is rarely seen today. Plates have been replaced with throwing more harmless objects, such as flowers. Within bouzoukia premises there is some special stuff, usually women that go around the tables selling trays of carnations. Clients buy these trays of ten or twenty carnations, to shower with them their dancing friends or the singers. 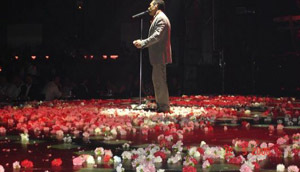 Quite often clients buy 10 or 20 trays of flowers and throw them along the trays to the performers on stage.Throwing flowers massively is a way of showing of your social status. This is usually done by guests at the front tables, which are the most advantageous ones. The flowers thrown by a company at bouzoukia can exceed the cost of the drinks they have consumed or even the basic salary. Greeks love dancing and they'll do it anywhere anytime. 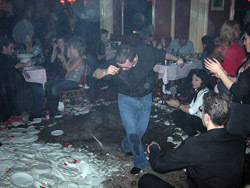 Bouzoukia is THE place for dancing and the customers adore it. After a couple of drinks and when the spirits are high and the guests start dancing. To do this no dance floor is necessary. They either go on stage and dance by their favorite singer or the climb on the table and dance there. Dancing on stage is what the majority of the guests prefers. Sometimes the stage becomes that crowded that the singer gets actually trapped within the happy dancing crowd! Tsifteteli, which is some kind of belly dance, is the women's favourite. The most beautiful and confident women dance to the rhythms of tsifteteli on the tables while they get showered with flowers by their friends. Another unique phenomenon in Greece is the relationship between artists and their fans. Even the most popular singers can be easily approached by their fans, especially at bouzoukia. 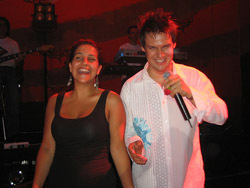 While the singer is on stage, everyone is allowed, as mentioned above, to go on stage and dance next to the performer. Guests are fond of talking to them, hugging them and pose next to them for a special picture – and during all these the singers keep on performing. The front tables of bouzoukia, which are attached to the stage, are those who usually the rich and famous reserve. The bills at these tables are usually large and the singers know that and therefore would do everything to please these “good” (meaning spending) clients. Most of the performers greet personally the customers, talk to them or even let them sing for a while (!). After the end of their performance most of the artists of bouzoukia will gladly accept in their dressing room any of the guests who would like to meet them. At photos see them posing next to their fans or greeting the front tables' clientele. If you cannot stand cigarettes smoke, you should never go to bouzoukia. At these clubs there is no division into smoking and non smoking area…just because almost everyone smokes. It is a fact that around 50% of the Greeks are smokers and bouzoukia-nightclubs must be the smokiest place you could go to. Some of the guests who'd like to show off may even light a cigar at bouzoukia. Being aware of that bad habit of Greeks, bouzoukia owners sale at the clubs “wardrobe” cigarettes packages. In case you bump onto a Greek who claims he has never been to bouzoukia, do not believe him. Not everyone is fond of this kind of entertainment, but everyone has at least once gone – or been dragged by his friends – to bouzoukia. There are of course bouzoukia fanatics, too. Some Athenians visit these clubs at least once a week. Moreover many prominent Greeks have been famous bouzoukia habitues. Aristoteles Onasis and former prime ministers Konstantinos Karamanlis and Andreas Papandreou frequented at bouzoukia. The latter did not hesitate to order his favourite songs and dance on stage. Even high schools of Athens arrange their balls at bouzoukia, so in case you find at some corner of tables full with students, do not be surprised. Within a competitive economy every enterprise has adopted several marketing techniques to promote its own products and services. Bouzoukia-nightclub could not be the exception to the rule. As mentioned above in Athens there are around 60 different bouzoukia. Competition between them starts when the owners book the performers. The more famous a singer the more offers he will receive from various bouzoukia owners, who would like him or her to lead the show at their club. After booking the artists, the advertisement starts. Big bouzoukia-nightclubs spend an exorbitant sometimes amount of money on advertisement. That includes TV spots, but mainly giant advertising posters all over Athens. These usually depict the main singers of each bouzoukia and the logo of the club. Innovating ideas for bouzoukia advertising posters. Bouzoukia is maybe the best place to see and understand a bit modern Greece and Athenian nightlife. For all those who have not been to Greece before its not advisable to go to bouzoukia without being accompanied by an Athenian. This will guarantee you having more fun and understanding better the way of entertainment at these nightclubs. As far as the costs are concerned, if you book a table you will pay at least 70 euros per person. Here find a list of the biggest and highly recommended Athens bouzoukia addresses and telephones. Charilaou Trikoupi & Kyprou, Bournaizi Sq. e-mail me for any questions about Greece you may have!